Impenetrable. The imaginary mountain barrier surrounding Mordor in the Lord of the Rings has nothing on this real-life wall of solid granite. For more than one hundred miles, from Mono Lake south to Owens Lake and beyond, there is a 10,000+ foot high crest that divides California from the rest of the country, which stops almost all precipitation from Pacific storms, and which denied immigrants an easy path to the gold-fields of the Mother Lode. The Sierra Nevada is a barrier to travel of all kinds: paths, wagon trails, roads, and railways cross the mountains in only a few places, and those few places present serious engineering challenges. No paved roads cross the mountains for well over 150 miles between Tioga Pass in Yosemite National Park, and Walker Pass south of Sequoia National Park (The only minor exceptions: Sherman Pass, a paved former logging road is inappropriate for heavy traffic, and a dead-end road that travels to Devils Postpile). The only freeways exist at Donner Summit and Tehachapi Pass. The Sierra beyond Yosemite provides some of the most stunning scenery on the planet. 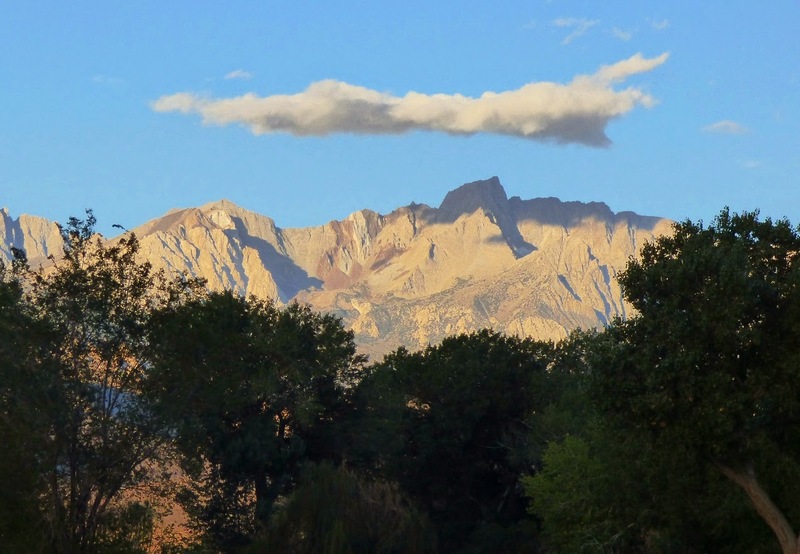 On the previous day of our fall trip we had crossed the Sierra Nevada at Sonora Pass, and explored the ghost town of Bodie, but the sun was disappearing in the west by the time we arrived at our campsite in the little town of Bishop in the Owens Valley. 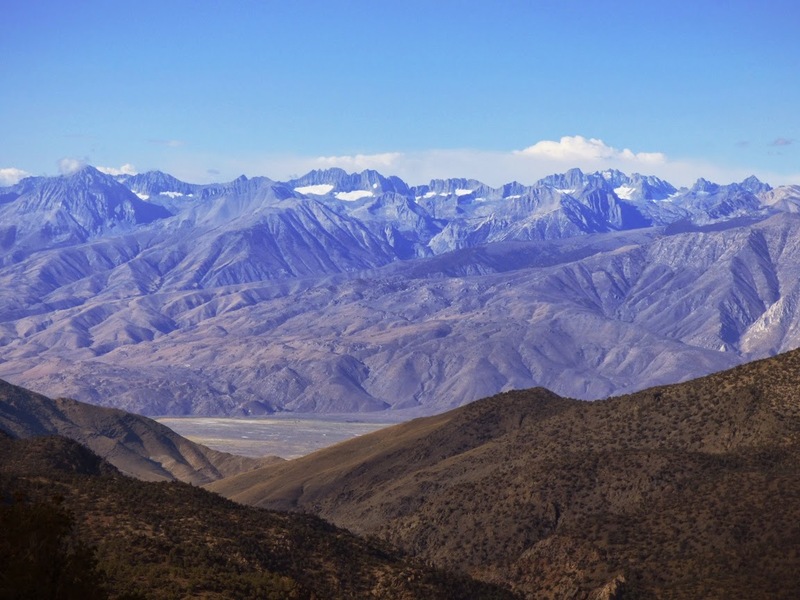 For those on our trip who were seeing these lands for the first time, it was a revelation to wake up to the high remote ridges of granite and metamorphic rock that towered over the flat valley floor. Many would say that Death Valley is the ultimate expression of basin and range style geography, and in many ways it is extraordinary, but few valleys in the world can match Owens for pure grandeur. One one flank, the Sierra Nevada rise to elevations exceeding 14,000 feet. On the other, the White Mountains average 11,000 feet, culminating in White Mountain Peak at 14,252 feet. Given the roughly 4,000 foot elevation of the floor of Owens Valley, the declivity is twice as deep as the Grand Canyon. Comparisons are unfair, of course, since the Grand Canyon is water-carved, and the Owens is of fault origin, but the scale of the landscape is grand in any case. The origin of the wonderful scenery is a two-edged sword, of course. 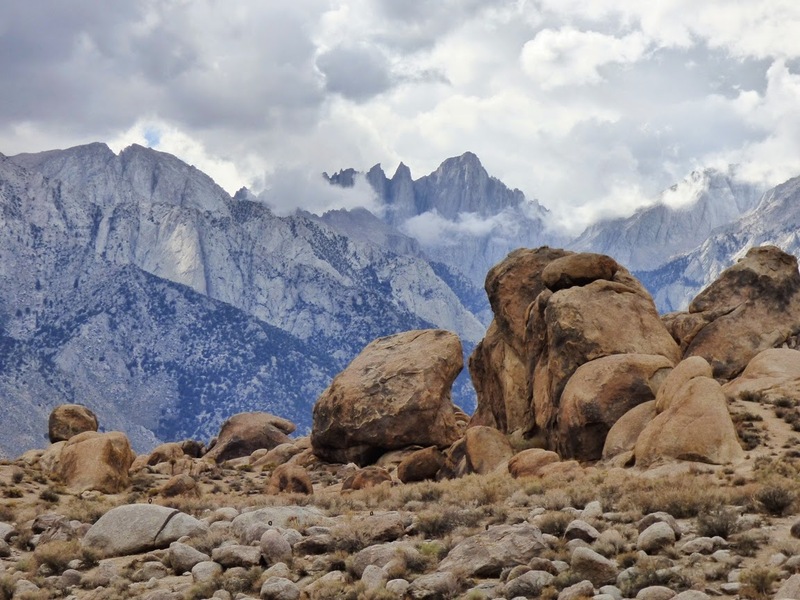 The faults that formed the Owens Valley are still very active. 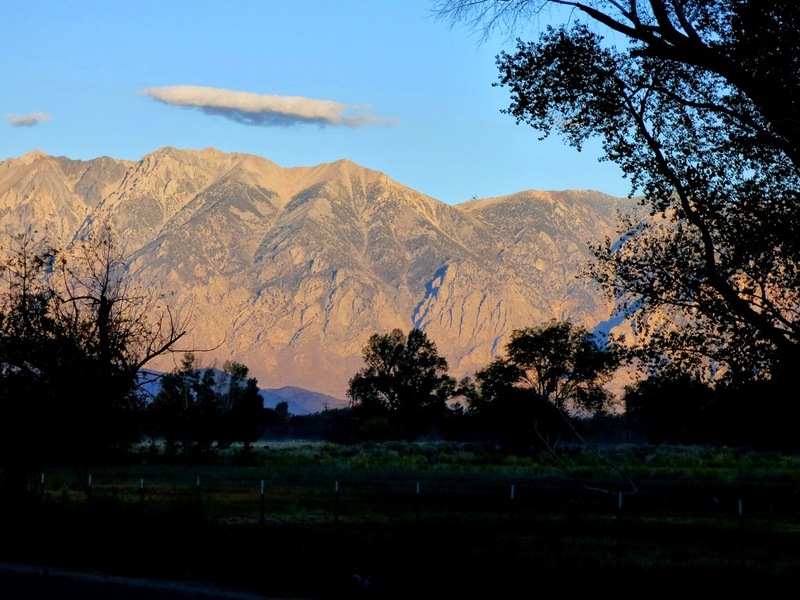 In 1872, the Owens Valley fault was responsible for one of the biggest earthquakes in the state's recorded history. The magnitude 7.8 event killed 27 people (out of a total population of around 300), and shifted the ground dozens of feet along a scarp more than eighty miles long. 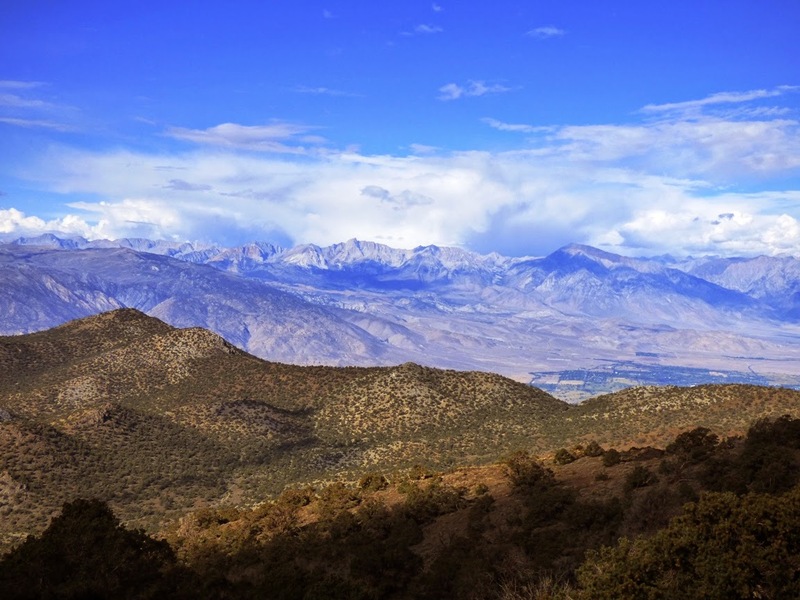 One of the most spectacular ways to see the mountain wall is to climb into the White Mountains and see most of the Sierra escarpment from one view point. It's called (by incredible coincidence) Sierra View, which is a pullout on the equally spectacular road to the Ancient Bristlecone Pine Forest. From the one view, one can see the Sierra Crest from the Tioga Pass area to south of Mt. Whitney, a distance of over 100 miles. We were blessed with a clear morning despite the fires raging throughout the region. 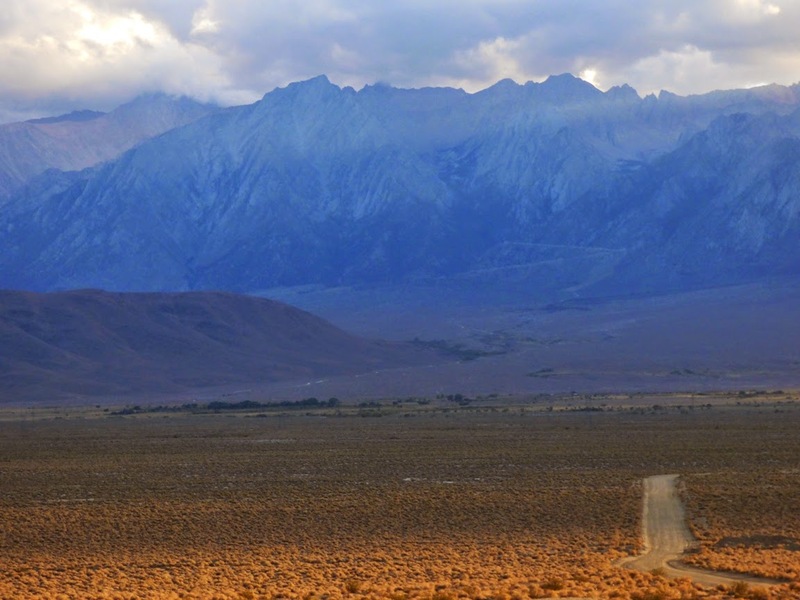 Later in the day we drove south to Lone Pine, which lies on the floor of the Owens Valley beneath Mt. 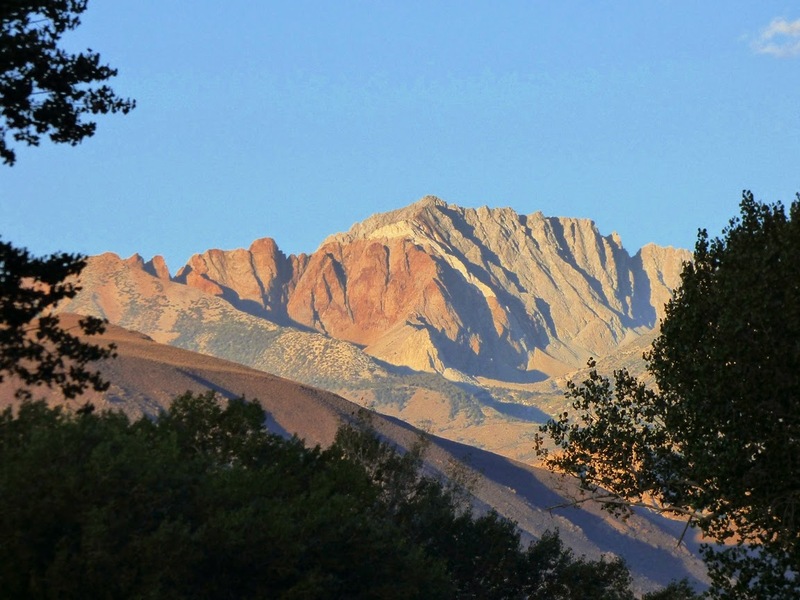 Whitney, which at 14,505 feet is the highest point in the lower 48 states. After a number of stops, we ended up at an old mine, the Reward, and watched the sun sink over the high ridges. 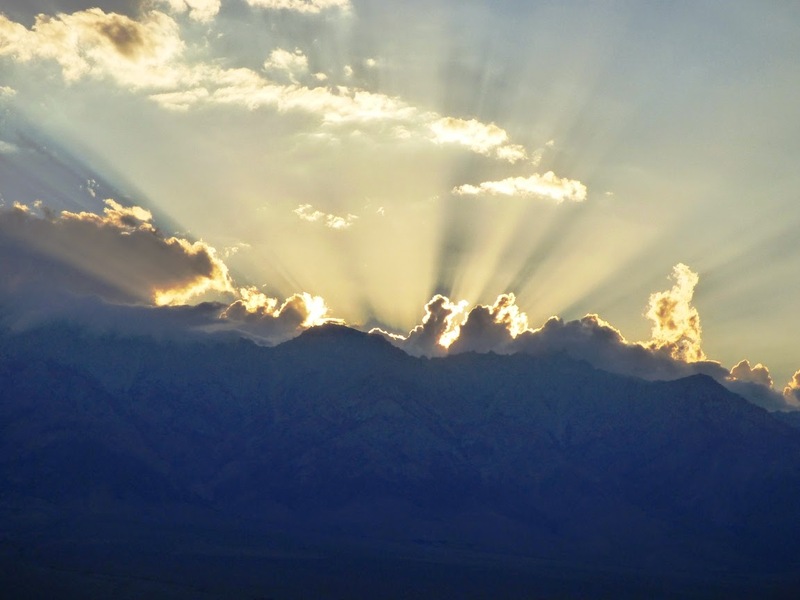 Sunsets for the people of the Owens Valley are different. There is no horizon over which the sun emerges or sets. There are only high ridges. When the conditions are right, the light show is wonderful. Gorgeous area, simply magnificent! Thanks Garry.